ArenaChicks in Philadelphia this Saturday, April 9th! Be sure to attend the K&S Wrestlefest “Super Saturday” convention in Philadelphia, PA this Saturday, April 9th! This will be a star-studded event featuring such legends as Ricky “The Dragon” Steamboat, Bobby “The Brain” Heenen, Lex Luger and many more! Wrestling fans should come out to meet these great legends and stop by the ArenaChicks table to meet our all-star cast of lovely ladies of wrestling! We’ve had a few changes to our cast for this Saturday. Due to circumstances beyond our control, Lorelei Lee will not be attending. However we have added April Hunter and Sara Del Rey! Sara Del Rey – former SHIMMER Champion, appeared in ROH, Chikara & more! Party with Kevin Nash & The ArenaChicks! If you’re heading to Atlanta for Wrestlemania weekend, you’ll have two chance to meet the ArenaChicks! 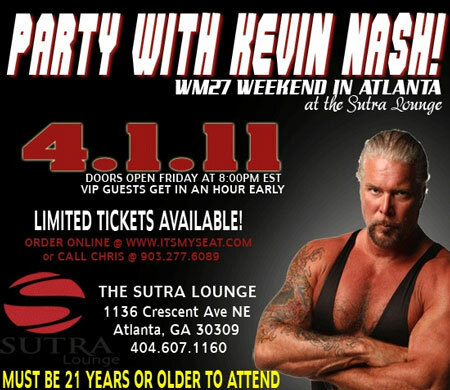 Amber O’Neal and Melissa Coates will join Kevin Nash and Sean Waltman at the Sultra Lounge in Atlanta on Friday night, April 1st. The Sultra Lounge is located at (1136 Crescent Ave NE; Atlanta, GA 30309. NOTE: YOU MUST BE 21 YEARS OF AGE OR OLDER TO ATTEND THIS EVENT! Ticket holders will have the ability to meet Kevin Nash and Sean Waltman, get an autograph by both of them and get your picture taken with them. Most importantly, you’ll get to hang out and actually party with the former Kliq members! This isn’t your typical wrestling convention with tables, lines, and a lot of waiting for little results! This is your opportunity to hang out, mingle and drink with hundreds of wrestling fans and two of the most influential superstars in wrestling history, Kevin Nash and Sean Waltman! Plus you’ll get to hang with with Amber O’Neal and Melissa Coates from ArenaChicks! 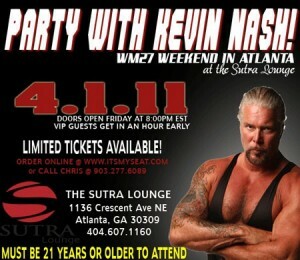 Click here for more info and to purchase tickets for the Kevin Nash Party! Don’t miss this unique opportunity and then come and see us and more superstars at the “Curtain Call for Bruno” convention by WrestleReunion! This past Saturday night (March 19, 2011) at the live CWF Mid-Atlantic event, ArenaChicks unveiled their brand new championship belt. The belt is gold with the distinctive artwork by Raven Jericho, the artist that created the ArenaChicks logo and cover for the first DVD release. The title belt was produced by Top Rope Belts, the official title belt producer of Pro Wrestling International (PWI), which ArenaChicks is a member of. Many thanks to Top Rope Belts! We recommend them to anyone and everyone that is looking for an amazing quality title belt!!! Mia Svenson answered the challenge wanting to prove that the “Scandinavian Sweetheart” could claim that Sweden produced competent grapplers as well. Despite the “coaching” from her manager, Skater failed to win the bout, as instead a double pinfall occured. Since the bout was scheduled to qualify the winner for the upcoming ArenaChicks Title Tournament, Amber O’Neal left the commentary booth to confer with the official and determine who would advance. However this brought out Sassy Stephie who told O’Neal that no tournament was need, snatching the newly created championship belt away, and declared that she would be the winner. All four women got into a scuffle and Board of Director member, Amber Gertner, decided that they could settle their differences in a tag team match later in the night. Sassy Stephie & Kellie Skater won the tag team challenge match over Amber O’Neal & Mia Svenson as Stephie pulled the tights of Amber O’Neal to score the pinfall. The ArenaChicks were as popular as ever with the fans in Burlington and more matches will be announced for upcoming dates including news about the ArenaChicks Title Tournament! “Rate Tank” Kellie Skater in action this Saturday! Australia’s “Rate Tank” Kellie Skater, the International representative of Coach Gemini’s All-Stars returns and the Coach has issued an International Open Challenge to any female wrestler in the world to face her! “Burlington, NC better be ready for the return of Kellie Skater!” Coach Gemini informed us. “My Australian All-Star has issued an open international challenge to face anyone that has to guts to step up to the indestructible Rate Tank. And personally, I don’t know of any woman that stands a chance,” the coach of the All-Stars noted. Skater has issued the challenge but the question is who will answer it? We do know that three other top wrestlers will be heading to Burlington as representatives of ArenaChicks. Sassy Stephie, Mia Svenson, and Amber O’Neal will all be in Burlington on Saturday night. For directions & ticket info please visit CWF Mid-Atlantic. The action will be filmed for the upcoming ArenaChicks Volume 2 DVD. 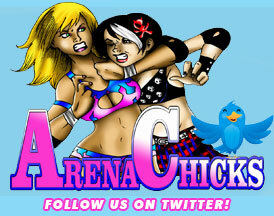 ArenaChicks to appear at K&S Wrestlefest in Philly! ArenaChicks.com is happy to announce that we will be appearing as part of the K&S Wrestlefest “Super Saturday” convention in Philadelphia, PA on Saturday, April 9th. This will be a star-studded event featuring such legends as Ricky “The Dragon” Steamboat, Bobby “The Brain” Heenen, Lex Luger and many more! UPDATED: Due to circumstances beyond our control, April Hunter will not be appearing in Atlanta at WrestleReunion. ArenaChicks.com is proud to announce that April Hunter and Amber O’Neal will be appearing at the WrestleReunion in Atlanta on Sunday, April 3rd at the Downtown Marriott. This is a special autograph & photo op session with the superstars of wrestling featuring the “Curtain Call for Bruno” as this will be the final appearance for Bruno Sammartino outside of the Pittsburgh area. ArenaChicks will have a table at this convention where you can meet the ArenaChicks, get autographs, get photos with them, and purchase select merchandise including our first DVD release. Doors will open at 10am and run until 3pm. Don’t miss this chance to meet your favorite wrestling stars all during WrestleMania weekend! For more info visit the official WrestleReunion website. ArenaChicks join WrestleReunion in Atlanta! We had such a GREAT time in Los Angeles at the WrestleReunion 5 convention that it wasn’t hard to convince us to head to Atlanta for a special WrestleReunion presents “Curtain Call for Bruno”. It will be a special day as wrestling greats and the biggest wrestling fans in the world converge on Atlanta for WrestleMania weekend. On Sunday, April 3rd WrestleReunion will host a special sendoff to the legendary Bruno Sammartino in what will be Bruno’s final appearance outside the Pittsburgh area. Joining Bruno is an awesome group of wrestlers including Scott Steiner, Mickie James, Bob Orton Jr., Kamala, Winter, Christy Hemme, Tommy Dreamer, Carlito Colon and… the ArenaChicks! The festivities begin at noon and run until 3pm at the Downtown Marriott in Atlanta. There is also a luncheon from 3-4:30pm. Be sure to come out to meet everyone before you head to the Georgia Dome for Wrestlemania! We’ll be posting our official guest list and preorders soon. This Saturday night ArenaChicks sponsors another HUGE match at CWF Mid-Atlantic’s “End of an Era Part 1″ live event! Burlington, NC will witness the debut of Jazz to ArenaChicks as she squares off with Amber O’Neal. A veteran from both ECW and WWE where she was a 2-Time WWE Women’s Champion, Jazz will be heading to CWF Mid-Atlantic’s epic event to teach local favorite Amber O’Neal a lesson in the ring. Will Jazz succeed in her plan to cripple Amber in her home arena? Or will Amber be able to prevail against this proven competitor? Watch it live this Saturday night at the Mid Atlantic Sportatorium in Burlington, NC! This match is slated to be featured on ArenaChicks Volume 2 DVD. When we decided to launch our very first DVD release in Los Angeles at the WrestleReunion 5 convention, we couldn’t have dreamed of the tremendous response we would receive from the fans and our fellow female wrestlers! It was an absolutely incredible weekend and an absolute pleasure to meet everyone!!! Everyone welcomed us so warmly and we want to thank you all again for your support at the table and for the tons of encouragement that you all expressed to us in this venture. Thank you all and with this first step we hope to be able to bring fans more appearances and more DVDs in the near future! With that we do have a few big announcements this week and hopefully even bigger things in the upcoming weeks!